Years ago in New York my wife and I had dinner at Una Pizza Napoletana, which had just opened in the East Village. There was a huge buzz about the place and the lines followed. Even at 6pm, we had to wait for about an hour. The restaurant was dominated by a custom-made pizza oven with the rather grumpy visage of owner Anthony Mangieri looming over his work station. The menu was uncompromising and a little harsh: four pizzas with a total of about 4 different ingredients. No appetizers, no pastas, no salads. When the dough for the day ran out, the restaurant closed. The pizza was a revelation — crust blistered, charred in places, silken mozzarella swimming in San Marzano tomatoes, shreds of basil and golden olive oil. Each bite divulged the purity of the ingredients – the milkiness of the cheese, the sun-drenched lightness of the tomatoes, the crisp, yet chewy, crust that had the tang and richness of a great sourdough. The crunch of sea salt was the first time I ever noted how salt itself could be used as an ingredient rather than a seasoning. It was an unadulterated dish — the product of a chef with a singular clarity of purpose and vision…and a little bit of pure rage. It was wildly expensive and worth it. I remember telling my sister (who owns four restaurants in Manhattan) that it was the best restaurant dish I had in years. Anthony Mangieri, stayed in New York for a while then moved Una Pizza Napoletana to San Francisco. Last I read he is in plans to make a NYC return. Seirinkan offers two pizzas – a Margherita and a Marinara. They also have a variety of appetizers and pastas. My son and I ignored everything else, and just got one of each pizza. The Margherita was light as air — a subtle schmear of fresh tomato sauce, ethereal mozzarella, basil, fragrant tomatoes and powerful hit of salt. The marina was simplicity defined. Tomato sauce — caramelized by wood heat — garlic, oregano and fruity olive oil perched atop a blistered, toothsome crust. As the master promised, it was pizza as simple and as complex as a perfect piece of sushi. 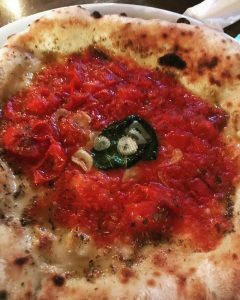 Kakinuma is the root of the apparent pizza renaissance happening in Tokyo. His students have spread, opening their own devotional spaces to wood, fire, dough, tomatoes and cheese. If Seirinkan is anything to judge by, I will have found the perfect counter-balance for those rare moments when my palate needs a break from Japanese cuisine. Rare moments?!?! Now come on! Are you, as omnivorous a chow hound as I’ve ever met actually going to suggest your palate is pledged to Japanese food? I’m not buying it! No, not limited to Japanese food…but I am still in thrall to the variety and quality of Japanese restaurants here that I have not been tempted to say, go eat at a French place. My urges for middle eastern food have caused me to learn how to make pita!